Cut to specifications for the granite industry, the Indian Granite Express has been a name synonymous with the trade for almost three decades. 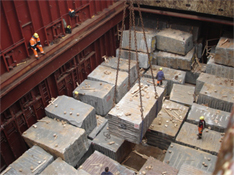 With an emphasis on minimum transit time and flexibility, the Indian Granite Express has been the backbone of granite movements, shipping over a million tons of granite spread over a hundred sailings annually. 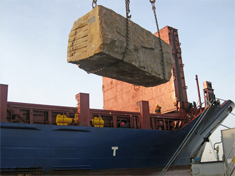 Puyvast is the largest granite carrier from India to most destinations all over the world. With a minimum of six monthly sailings from Kandla, Goa, Karwar, Mangalore and Tuticorin on the West Coast, and Vizag, Kakinada, Krishnapatnam and Chennai on the East Coast, to several destinations in South East Asia and For East, this express service delivers cargo within a maximum transit time of 25 days. Puyvast also offers regular monthly sailings to North European, Mediterranean, Scandinavian and UK Ports and largely servicing the port of Antwerp, which is the gateway for aII granite shipments to Europe. •Towards Far East: Hualien / Hong Kong / Xiamen / Shihu / HCMC. •Towards Europe: Marina di carrara I Porto Marghera / Alicante / Leixoes / Vigo / Bilbao / Pasajes / Rotterdam / Antwerp / Gdansk / Stettin.